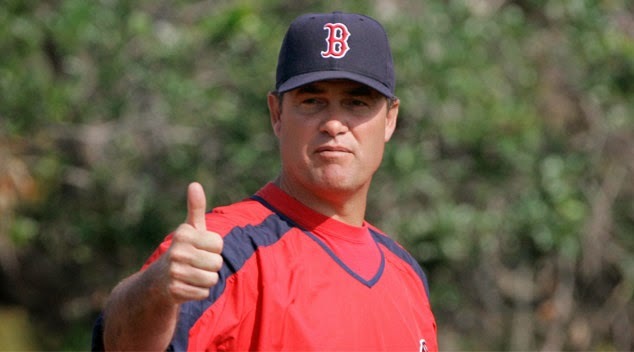 John Farrell reminds us that it's all good. One game. One stinkin' game after winning a World Series and, "Oh no! John Farrell doesn't know what he's doing!" Ever think for a minute that he's trying to give a guy a chance early in the season; put him in a situation and see how he handles it, then use it as a teaching opportunity? The 2014 Red Sox are a new squad. They're young. They're inexperienced. They're one game into the season! Go ahead and be upset that they left 12 runners on base and went 0-for-10 with runners in scoring position. Be mad at Mike Carp for not tagging on Xander Bogaerts' fly ball, which potentially would have led to him scoring on the next deep fly by A.J. Pierzynski. Those things happen, though. Dare I say it again: We're one game into the schedule. Don't go jumpin' off the Tobin yet. Farrell isn't losing sleep over any of these decisions and as fans, neither should we. I think it's quite hilarious how some of the Sox beat writers will point out that Farrell won a World Series just a season ago when all odds were against him. Yet, they'll say that he "will be in for some criticism" after his blunders in Game 1 of 162. Oh, but don't tweet them later in the year second-guessing a move Farrell makes. They'll be quick to point out that championship ring he owns. Relax. Fans, writers, bloggers and talking-heads alike. I scoured Twitter postgame Monday (won't be doing that again) and found several folks acting as if the Sox had just fallen out of first place in late September. For all that went wrong, Boston was a bloop away from being 1-0, not 0-1. Jon Lester was magnificent. Dustin Pedroia upped his Opening Day hit streak to eight games. Need we mention Grady "The Natural" Sizemore? Or the fact that there were a lot - I mean A LOT - of hard hit balls and the Sox chased Chris Tillman after just five innings (104 pitches)? Good signs all around. And in time, a game like Monday's will be a "W."